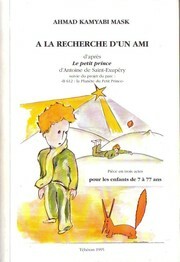 2 editions of A la recherche d'un ami found in the catalog. Add another edition? Are you sure you want to remove A la recherche d'un ami from your list? Published 1995 by A. Kamyabi Mask in Paris . This is a bilingual edition of A la recherche d'un ami, in French and Persian. February 26, 2014 Edited by Salar Abdolmohamadian corrected info. February 7, 2014 Edited by Salar Abdolmohamadian supplied info. February 7, 2014 Created by Salar Abdolmohamadian Added new book.